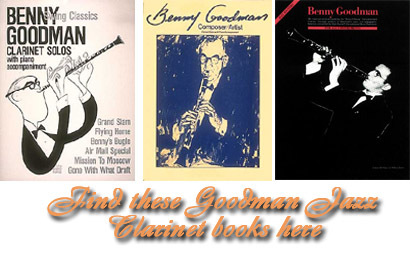 Clarinetist Benny Goodman was born on May 30th, 1909 in Chicago and lived to June 13, 1986. He became noted as King of Swing, Patriarch of the Clarinet and The Professor. One thing about Goodman's music you will notice immediately is how FUN and ENERGETIC it is. Burnin’ red-hot jazz is definitely not out of style. Clarinet players today spend so much time on the serious music: Brahms, Beethoven, Mozart, Rose Etudes, Messian, etc… Well, how about just letting it all hang out and learn a new style. Believe me, you'll have the same embouchure, breath, finger and mental challenges of playing clarinet by playing jazz as you do studying legit clarinet. Also, this is a great excuse to learn your scales even that much better. But, I don’t know how to improvise. That is just fine. How about reading the music and attempting to swing as you read? There are some great books that have Mr. Goodman’s solos written out. I’ll lead to you some of them below. Now, go get your clarinet, go get your Clarinet, NOW! Check out this performance of Sing, Sing, Sing. Consume yourself with listening to his style, the excitement of his music and the smooth, yet burnin’ clarinet licks throughout his music. Try to pick up some of his solos. The best way to learn jazz is to transcribe solos from the recordings. If I were you, try a slow song first. One of the best, or my favorites, is Goodbye. Start by trying to figure out the key signature and then the first few notes. Then add-on a phrase at a time and once you have the first few notes, start writing them down on musical staff paper. Look at your music but also try to memorize it or feel it the best you can. Having the music internalized in your ear, mind and fingers will help you “know” the solo better as well as pick-up the style quicker. Play the tune over and over via the recording and then on your clarinet. Play with Mr. Goodman and try to “swing” with him. THIS IS THE BEST WAY TO PICK UP A NEW MUSICAL STYLE. IF YOU DON’T HAVE THE PATIENCE TO TRANSCRIBE, BUY A BOOK AND READ THROUGH THE MUSIC. You will actually not pick the music up as well if you never hear the mastery of Goodman and just try to read his music. However, this is better than nothing. If you do, buy a book and make sure you have a recordings of the music in the book. Hopefully, the recordings are in the same key as the book, if not, it is a good time to start transposing the written solo to go with the recording. Again, note how I’m writing this, buy a book, but LISTEN TO A RECORDING OF THE SOLO. Then, play the solo with the recording. Again, this is a good way to pick up jazz. Since clarinetists today have a rare chance to play with a jazz band without doubling on saxophone, many clarinetists just don’t try playing jazz. BELIEVE ME, YOU WILL HAVE FUN. Here is a great place to start. Let’s Dance, Flying Home, Benny’s Bugle, Slipped Disc and Sing, Sing, Sing are all on this sheet music/CD combo. Click on the cover art below for more information. Goodman, Composer/Artist is the best of all of the solo methods except that it does not include chord changes over the clarinet or piano parts. It is most easily readable for the classically trained clarinetist who wishes to learn jazz style. 25 of Benny's greatest clarinet solos all wrapped up in one book to include tunes on some of the YouTube videos below: Sing, Sing, Sing; Flyin Home; and Slipped Disc. 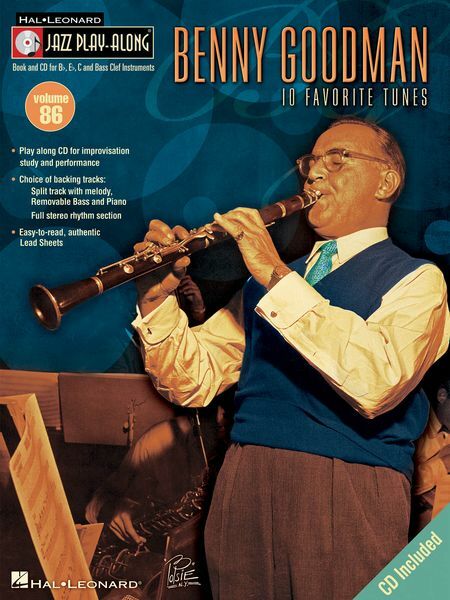 Benny Goodman: Swing Classics. Clarinet Solos with piano accompaniment. Six of Benny's solos do include the chord symbols. Jazz Masters. Goodman. 30 important solos as played by the "King of Swing" includes chord changes. The thorough analysis of clarinetist Benny Goodman's style by Stan Ayeroff are fantastic. Also, the background behind the solos are informative. This book includes these solos for clarinet only and have no piano accompaniment. You can find this book here.